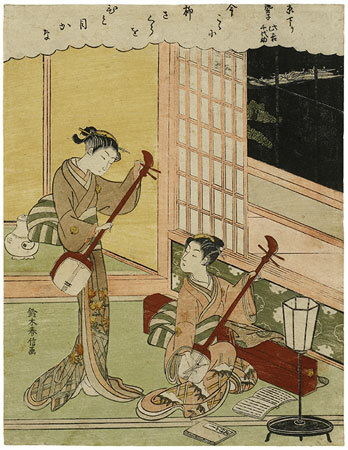 Two geishas are playing the shamisen. In the clouds at the top the title: “Kyō kudari geiko Konoyoshi, Chiyosuke” (“The Geishas Koyonoshi and Chiyosuke Visiting from Kyōto”) accompanied by the haiku: “Now and here / one sees at a glance / willow and cherry blossom.” This seems to be the last surviving print of this unusual woodcut. It may be a work by Shiba Kōkan (1747–1818) imitating Harunobu. Harunobu designed at least two other prints of young beauties from Kyōto. The poem suggests that it was a rare privilege to see these girls, and it is possible that the print was commissioned privately and distributed to potential patrons. of the willow and cherry tree. The figure at the left is particularly thin and elongated, and it is often suggested that late prints of this type were contemporary forgeries by Shiba Kōkan. Harunobu died suddenly in 1770. Many people were unaware that he had died and many of his sets were uncompleted. It seems likely that Harunobu's publishers commissioned pupils and followers to design prints in Harunobu’s style to which they added Harunobu’s signature. It is certain that Kōkan was one of these artists. His “confession” seems to say, however, not that he was a successful forger, but that he was dismayed by the fact that the general public, unaware that Harunobu had died, though that his prints, which he thought were daring and innovative, were being credited as Harunobu’s own work. In his charging, he made arrangements with the publishers to publish his prints under his own name, Harushige. Very shortly, however, he lost interest in ukiyo-e and gave up print design. The question of whether Harunobu changed his style towards the end of his career or whether works like this one are designs by followers is still unsettled. It will be solved by a more careful study of prints like this one. Records may exist which mention the visit of Konokichi and Chiyosuke to Edo, and the publication of the print can be pinpointed to this time. If it was before 1770 then there should be little doubt that Harunobu designed it (unless we prefer to argue that designs or figures we do not personally prefer were designed by pupils and only signed by the master). If the visited Edo after the 6th month of 1770 when Harunobu died, then there is no question, signature or not, that the print was designed by another artist.